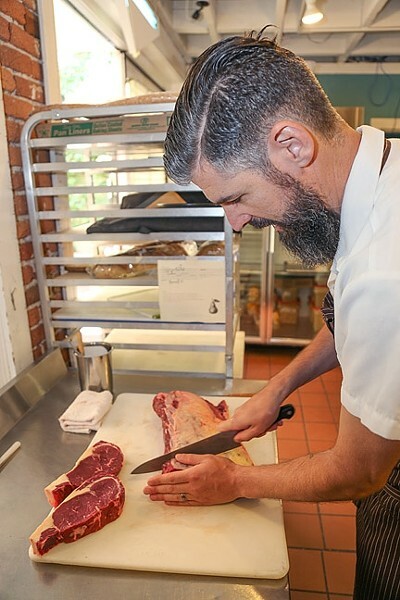 The season was turning cold—freezing—when Chef Tim Veatch and his beloved companion, Jeriel Sydney, arrived at a rural farmhouse in Parma, Italy, in pursuit of pork. They’d heard that the farmer who lived there would be breaking down two black Parma hogs for charcuterie, so they jumped at the opportunity to help slaughter, process, and cure the meat. EASY DOES IT: Thomas Hill Organics Executive Chef Tim Veatch doesn’t think good food should be too complicated. In fact, he proves it with minimalistic preparation of insanely delicious local ingredients. Up until that point, the couple had been working at farms across Italy as part of the WWOOF (World Wide Opportunities on Organic Farms) program, which exchanges free room and board for farm labor. How exactly did these two city dwellers end up on a four-month farming tour, with a detour into forestry? Well, for one, a flooded Bay Area basement apartment, so “old, cold, and full of mold” it had become unlivable. Plus, Veatch had been slaving away in kitchens for years. Italy had provided an exhilarating experience so far. It felt good working outside in the fresh air; no BART cards. No smog or fog. Now, the pair found themselves hunkered down for the winter, wearing wool socks and long underwear to keep out the biting cold. This time, “harvest” had nothing to do with pulling olives off trees in a scenic Tuscan orchard, making sheep’s milk cheese in Piedmont, or foraging for wild mushrooms. It meant turning a live pig into food that would last till next winter. This wasn’t exactly new for Veatch, who grew up in Sacramento hunting, ocean fishing, and barbecuing big, boisterous meals with his family and neighbors (one of those neighbors being his best friend and future Chef Gary Podesto at legendary farm-to-table Berkeley eatery Chez Panisse). Jeriel, who became Veatch’s wife a year later in 2015, has always been up for adventure. “She blew out the hog’s intestines with a straw, so she went for it,” Veatch said during a recent chat at his newest gig at Thomas Hill Organics in Paso Robles. Jeriel used the excess fat to make lye—which eventually led to her current business, Fable Soap Co. For Veatch, the experience provided further proof of what he already knew to be true: healthy, happy, sustainably sourced ingredients need little to no fussing with. In other words: Let nature do the work and try not to muck up the flavors in the process. Veatch remembers sitting down with a farmer and two, truffle-hunting poodles (yes, poodles). 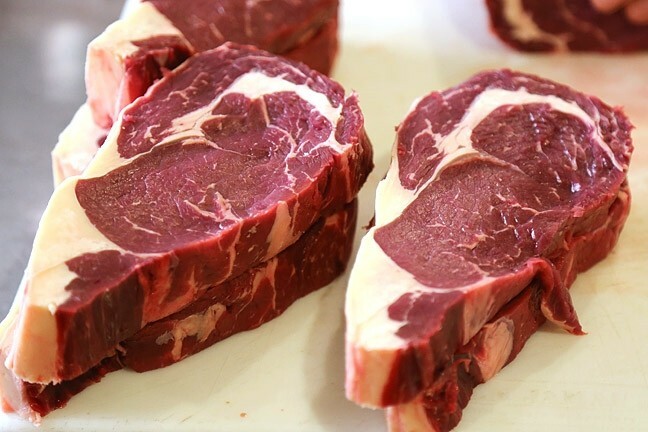 EAT WELL: Local grass-fed beef from PC Cattle Co. shows off a dark wine color and gorgeous marbling. I caught Veatch on an exciting day: He’d just gotten his hands on a whole, locally sourced PC Cattle Co. beef loin that had been alive about a day before. While he busied himself slicing into the well-marbled meat, I marveled at the deep, sultry red wine color—a sign of the animal’s grass diet and rich flavor. Later in the day, a whole gaggle of Sonoma sourced Liberty ducks were slated to arrive—after a mere eight-month wait list. But it wasn’t just access to incredible ingredients that attracted Veatch to his adopted home of Morro Bay. It’s about what life is like here, how it breathes. Surfing. Chewing the fat with local farmers like Larry Kandarian and Bill Spencer. Cooking excellent local ingredients for unfussy people. Repeat. Veatch graduated from culinary school in the Bay Area just over a decade ago and has filled every year thereafter with layer after layer of culinary exploration. He moved directly to Morro Bay, and “harassed the hell out of” Pandee Pearson, who worked for Wolgang Puck in the ’80s and has since headed local restaurants like Windows on the Water and Gardens at Avila. There was only one problem. Veatch had focused mostly on pastry at culinary school, and Pearson was doubtful. “So I showed up on Valentine’s Day, and asked if she needed any help. It was slammed. I blasted through some chopping work. Then, she needed some salmon broken down, so I said, ‘I can do that,’” Veatch said. After much debate, Pearson relented, allowing the young chef to prove his merits. Veatch, who started ocean fishing with his dad at the tender age of 8, removed the scales and filleted the meat, in a few deft moves. This was, for all intents and purposes, the beginning of his true chef career. However, it would be several more years until he settled on the Central Coast for good. In the meantime, he earned burn marks, Michelin stars, and farm-to-table experience in the Bay Area working as a pastry chef at Cavillo Point Lodge, Farm Stop, and Saison. He also tended fire as a wood-oven cook at Camino in Oakland, where he heightened a menu that changed daily with nothing more than humble fire, acid, and salt. Although he knows all the tricks in the book, he’s not one to slap a bunch of butter or sauces on anything—in fact, he only uses a drizzle of olive oil in the pan, if much of anything at all. Over the years—and throughout his travels—he’s learned restraint. The chef prefers a mortar and pestle to bring out the fragrant loveliness of garlic, and if it’s in season at the farmers’ market, he’s probably all over it (just ask him about the best apricot he’s ever eaten). Simple is so good. Thomas Hill Organics is located at 1313 Park St. in Paso Robles with a SLO location coming soon. For more information visit thomashillorganics.com or call 226-5888. Hayley Thomas wishes food could truly sing. She can be reached at hthomas@newtimesslo.com.